A fairly common fault is for a Norton product such as Antivirus, Internet Security or 360 to report that your subscription has expired when it hasn’t. This can be due to a number of issues and often occurs after some major Windows updates or when there are problems with the Symantec (Norton) subscription servers. The best methods to address this I have found are to do these in steps in order. If any one works then you have resolved the problem and need to go no further. Before trying these you will need to be connected to the internet. 1. Try a manual update – Open the main program window (double click on the tray icon or open it from the desktop icon) and do a ‘check for updates’. 2. Restart the computer – This ensures you have nothing that is pending a restart and affecting the definition updates. 3. Force a subscription check – In the main Norton window, click “Support” then click on “Subscription Status”. After the “Subscription Status Check” is complete, click “Finish”. This updates the subscription information of your installed product to the status that is stored on the Symantec (Norton) servers. 4. 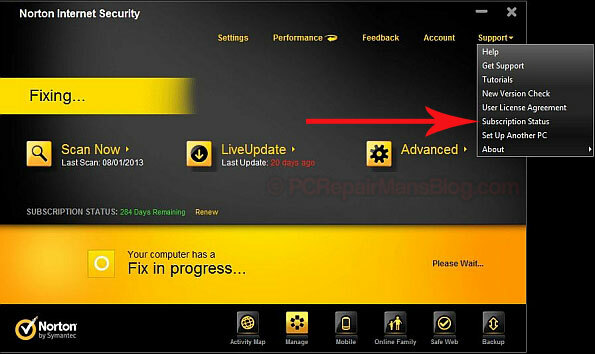 If you still have an issue beyond this then you will need to login to your Norton Account and check your subscription status then raise any issue you have with Symantec support. Use the menu “Support” then “Get Support”. If you didn’t create a Norton Account then you can still talk to support, just try to have your serial number handy from the original installation. Advanced, Antivirus, Beginners, Frequently Asked Questions, Intermediate. permalink.